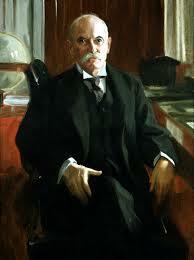 Today in Masonic history Nelson W. Aldrich is born in 1841. Nelson W. Aldrich was an American politician. Aldrich was born on November 6th, 1841 in Foster, Rhode Island.He attended schools in East Killingly, Connecticut, before going on East Greenwich Academy in Rhode Island. Aldrich began his working life working for the largest wholesale grocer in Rhode Island. He worked his way up through the ranks of the company and would eventually become a partner in the firm. He served during the American Civil War as a private in Company D of the 10th Rhode Island Infantry. By 1877 Aldrich was having a major effect on state politics. In Rhode Island he was the president of the Providence city council and speaker of the Rhode Island House of Representatives. In 1881 Aldrich was elected to the United States Senate and served until 1911. During his time in the US Senate Aldrich was a very influential Republican Senator to the point that the press had referred to him as the "General Manager of the Nation". He was one of the 'Big Four', a group of Republican Senators who were viewed as controlling all of the decisions in the United States Senate. Aldrich was responsible for many pieces of legislation while in the Senate which included helping to establish the Federal Reserve System and the 16th Amendment, which he originally opposed, establishing an income tax system. Aldrich passed away on April 16th, 1915. Aldrich was an active Freemason in Rhode Island and served as Treasurer of the Grand Lodge of Rhode Island.